Mondays can be a bit of a drag. Sometimes, when the kiddos are restless and mommy is filling frustrated, we like to pile into the car and push the reset button via a drive-thru. Today, to celebrate their 75th Anniversary, Dairy Queen is offering a free cone to all their fans! Hello friends! My apologies for the lapse in blogging. Our baby stopped sleeping at night time, and then I converted my office into a playroom. The good news is, I’ve cordoned off a corner of silence to pick up my writing again and I am looking forward to an exciting spring filled with adventures. Come join us! Mark your calendars for this awesome event on September 27th! There is free admission and transportation to all the museums in the cultural district. This is a very family friendly event. The hardest part will be prioritizing which museums to hit before nap time! Maybe this video will help. P.S. We’d love to know if you are there too! Use the hashtag #freefundfw to follow along. I’m sure many of you are so exhausted from getting back into the school routine that you are not looking for more fun. You’re probably looking for more rest! However, for moms like me who have young children, not yet in school, it is essential to find ways to have fun at home, especially for the days when we’re not going to make it out of the house. Here are a couple of ideas I recently have discovered. 1. Indoor Splash Pool: Get a large bowl of water with a few bath toys. Put the bowl on the floor with a towel around it, and let your baby go to town. This seriously kept my little man busy for about 20 minutes. That is really exciting considering the fact that I got all the dishes done and the kitchen cleaned in that time. Sensory play anyone? 2. Baby In a Basket: Get a laundry basket. Put your baby in it with some toys. Get your laundry folded with a happy baby. I don’t know what it is, but he seemed so excited to be inside something and playing. Unexpected, but I’ll take it. Anyone else have ideas for entertaining babies in the clingy I-only-want-mom-stage? Everyday is free at the Dallas Museum of Art. But if your brain blows for bubbles, Texas­-sized bubbles are blown the first Tuesday of every month. Plenty of other similar whimseys await your budding artist. On September 2, they’ll kick off Hispanic heritage month with art, story times, and performances designed for the under-5 crowd. Check the schedule, and you too can make your own rain stick or Mayan city! Come fire the water cannons of Canon Parkway Park. You’ll be blown away by this dynamic splash pad. Once you’ve fought every water battle to your heart’s content, check out the awesome play structure and basketball courts. Insider tip: If the canons aren’t firing at full power, there’s a red button on a green post to bring the fun to life. Amenities include port-a-potties and shaded picnic area. Bucket of fun sure to be had by all! Here’s the address: 750 Cannon Pkwy, Roanoke, TX 76262. It’s easy to find, just across the street from Hawaiian Falls in Roanoke! • Large Open Field for Kite Flying, Soccer, etc. Congratulations, Gina! We hope you enjoy these lovely hair ties and headband. By the way, Gina blogs over at Someday Saints about life with five sweet babies. I loved browsing through her cheerful and vibrant posts about motherhood, homeschool and fitness. Thanks to all who entered, and very special thanks to My Personal Therapy for the fabulous giveaway goodies! Are you ready for an end of summer road trip? I’ve rounded up a few of our favorite and most valuable car diversions for my tiny tots to share with you! Survival is assured. 1: Crayola Window Markers. These are every bit as fun as they sound. My 2 year old had a blast with these for almost an hour! 2: Winnie the Pooh Audio CD. My parents read these to me as a child, so the stories are filled with fond memories. I was delighted when I discovered this CD to share with my own children! 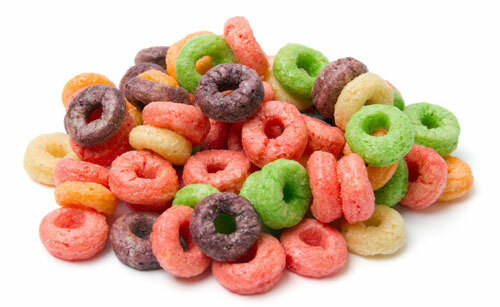 3: Cheerios and Fruit Loops. Boy howdy. In 17 hours, we threaded these on yarn, made pipe cleaner bracelets, had cheerio wars and snacked. I now know why they are baked in the shape of a lifesaver! What are your must-have car trip essentials? 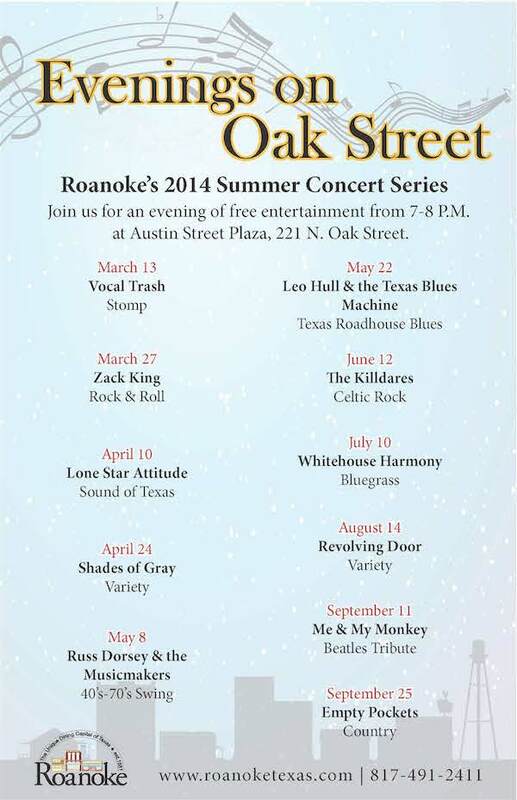 Friday, August 15, Revolving Door will be playing at the Austin Street Plaza in historic downtown Roanoke at 7pm. One of the highlights of the Edel Gathering was Friday evening’s cocktail party and shoe competition. I made a pair of Tiffany-inspired shoes my my daughter and me. Pearls, and that classic Tiffany blue transformed a pair of clearance rack flats in no time. My Personal Therapy created a gorgeous pearl and blue headband that matched PERFECTLY. We had compliments all night long (at least until bedtime!). My Personal Therapy (isn’t that an awesome name, by the way?) creates beautiful headbands and hair ties. I had the chance this past week to sample their hair ties as well and they made me feel so trendy! The printed elastics are hip enough to wear as a bracelet. This fall, they are introducing shabby and fabulous boot cuffs. I didn’t know such cozy things existed! 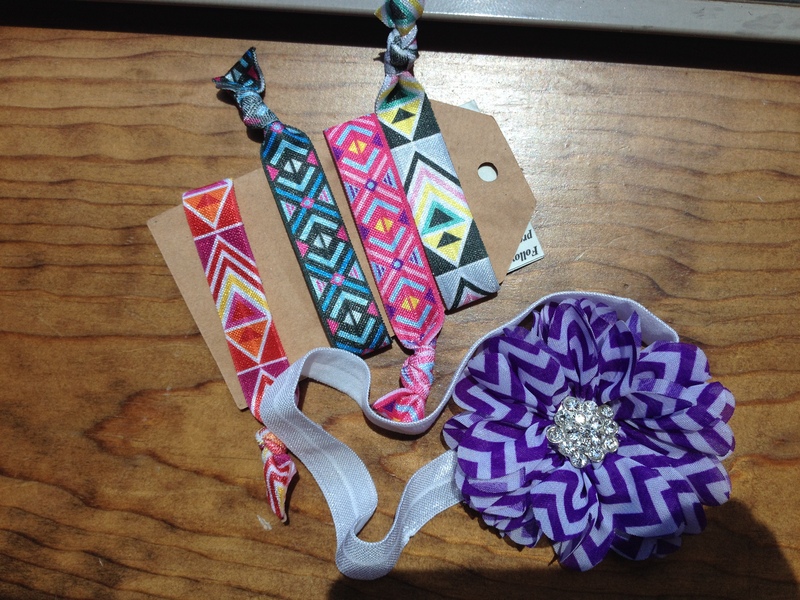 We are so excited to offer a set of four aztec hair ties and a purple chevron headband. Please enter by commenting how the weirdest/randomest/funniest place you’ve found a hair elastic in the past 24 hours. Contest will close on Wednesday evening at midnight and winner will be drawn at random. Thanks again for the samples, My Personal Therapy! Here’s one more look at the chevron headband. Isn’t it adorable?